Introduction: Coumarins exert many biological effects in humans, animals, and plants, which make the evaluation of their biological activities and study of their role in ethnomedicine highly valued. Objectives: Here, we selected seven plants which have ethnopharmacological use as antimicrobial in Iraq and the aims were to quantify the two structural isomers bergapten and methoxsalen in their seeds, to evaluate the antibacterial activities against several clinical isolates, and to isolate bergapten and methoxsalen from Ammi majus. Materials and Methods: Seven plants were extracted by petroleum ether (PE) and ethanol (EtOH). Bergapten and methoxsalen were separated and purified by preparative thin-layer chromatography. Quantification of the furanocoumarins has been conducted by high-performance liquid chromatography, and all the plant extracts and pure compounds were checked for antibacterial activities utilizing alamar blue microplate assay. Results: Cuminum cyminum was deprived of bergapten and methoxsalen and methoxsalen was not detected from Apium graveolens. Bergapten was abundant in PE more than in EtOH; on the other hand, EtOH was rich in methoxsalen. 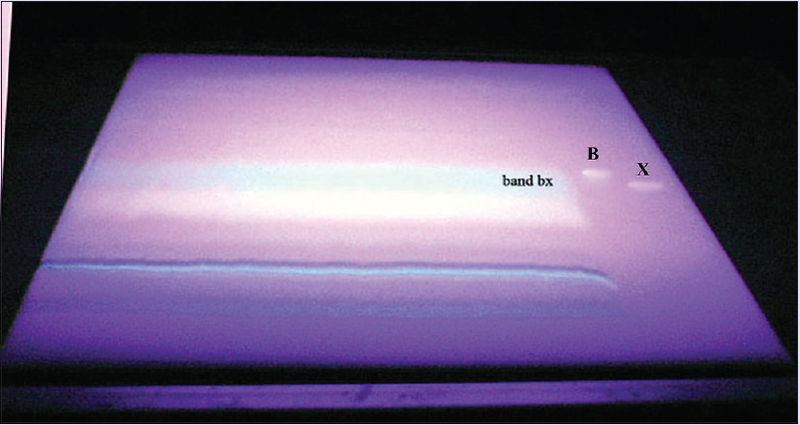 The separation of the two structural isomers was performed using normal phase chromatography and ultraviolet light as an indicator. All extracts showed weak to moderate antibacterial activities against Gram-positive isolates which were more sensitive than the negative ones. C. cyminum extract was least active, uncover the antibacterial role of bergapten and methoxsalen. Conclusion: These findings support the medicinal use of seeds of seven plants from Apiaceae family and quantify the two pharmacologically important furanocoumarins (bergapten and methoxsalen). Abbreviations used: EtOH: Ethanol; MIC: Minimum inhibitory concentration; PE: Petroleum ether; Rf: Retardation factor; Rt: Retention time. This study was conducted to evaluate the antibacterial activities of seven plants seeds used in local medicine in Iraq. High-performance liquid chromatography was used to quantify bergapten and xanthotoxin in non-polar and polar extracts of these seeds. This study supports the medicinal use of these plants and clarifies the role of bergapten and xanthotoxin in antibacterial activities of these plants. Coumarins are consumed daily from diet and many herbal medicines, and these unsaturated lactones exert many biological effects in humans, animals, and plants, which make the evaluation of their biological activities and study of their role in ethnomedicine highly appreciated. In plants, coumarins are working as phytoalexins defending the plants against microbes., Chemically, there are several kinds of coumarins; furanocoumarins constitute one of the important bioactive coumarin groups which showed variable effects and antimicrobial is one of these effects. Several plants from this family are widely used in Iraq for the treatment of many ailments such as bronchitis and urinary tract infections. Here, we selected seven plants that have ethnopharmacological application as antimicrobial in Iraq and the aims were to quantify the two structural isomers bergapten and methoxsalen in their seeds, to evaluate the antibacterial activities against several clinical isolates, and to isolate bergapten and methoxsalen from Ammi majus. [Table 1] shows the plants' profiles. All plants were collected from the botany garden, College of Pharmacy, University of Baghdad, in 2005 and authenticated by the State Board for Seed Testing and Certification, Department of Plants, National Herbarium of Iraq. Voucher specimens (AM-050315-1, AG-050315-2, ApG-050315-3, CC-050315-4, FV-050315-5, PC-050315-6, and PA-050315-7) were kept at the Pharmacognosy Department, College of Pharmacy, University of Baghdad. The plant material was cleaned and pulverized by mechanical mills and weighed. Each plant (50 g of seeds) was extracted by refluxing with 500 mL of petroleum ether (PE) at 70°C more than one time until exhaustion, the PE filtrates were combined and evaporated under vacuum at 45°C until complete dryness, and another 50 g of seeds of each plant was refluxed with 95% ethanol (EtOH) at 90°C until complete exhaustion. Ethanolic extracts (EEs) were dried under vacuum. PE and EtOH were supplied from Fisher Scientific, USA. SiO2 thin-layer chromatography (TLC) plates from Merck, USA, silica gel 60 F254 precoated layer thickness of 0.25 mm (10 cm × 20 cm, 20 cm × 20 cm, 10 cm × 10 cm). Preparative TLC plates from Merck, USA, silica gel 60 F254 precoated layer thickness of 2 mm and 0.75 mm (20 cm × 20 cm). 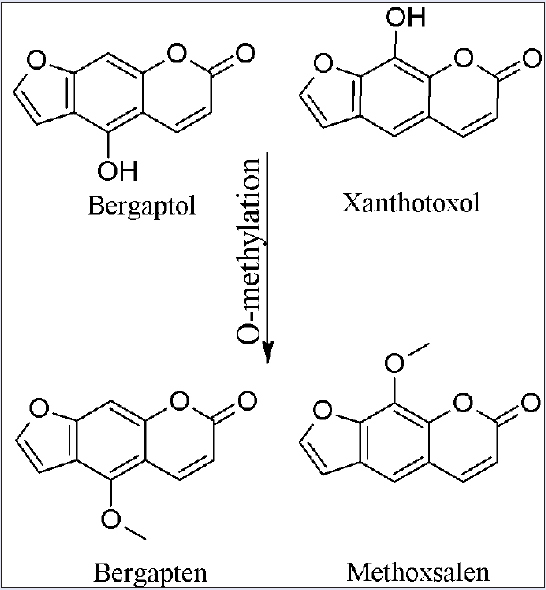 The quantification of bergapten and xanthotoxin in non-polar and polar extracts of the seven plants seeds, has been done using, Knauer high-performance liquid chromatography (HPLC) system and utilizing a ChromGate data system version 3.1 software for a personal computer linked to HPLC apparatus. The HPLC system composed of Knauer K501 pump connected to Knauer K2500 ultraviolet (UV)/visible detector. Deionized water produced by water distiller, PURELAB Option-Q, UK. S1: benzene/ethyl acetate 90:10, v/v; S2: toluene/diethyl ether 50:50, v/v, toluene (50 mL), and diethyl ether (50 mL) were shaken for 5 min with 50 mL of 10% acetic acid in a separating funnel. The lower phase was discarded, and the toluene-diethyl ether mixture was used for TLC; S3: toluene/ethyl acetate/formic acid 70:20:10, v/v; S4: benzene/acetone 90:10, v/v; S5: benzene/acetone 80:20, v/v; S6: chloroform/methanol 99:1, v/v; S7: chloroform 100%; S8: ethyl acetate100%. The solvents were HPLC grade from Fisher Scientific, USA. Bergapten and methoxsalen were purchased from Sigma-Aldrich, USA, with purity >99% by HPLC. PE extracts and EEs were dissolved in chloroform 1 gm/10 mL. 10 μL of each extract was applied aligned with bergapten and methoxsalen standards, SiO2, 60 F254 precoated 20 cm × 20 cm plates, S3: toluene/ethyl acetate/formic acid 70:20:10, v/v, UV light at wavelength 366 nm. PE extracts of each plant were washed several times with 80% EtOH to yield clear ethanolic filtrates, combined and evaporated to dryness under vacuum; the purified extract and marc residue were analyzed by TLC using S1 and S3 as development systems then kept aside for future studies. The EE of each plant was dispersed in 200 mL of distilled water and washed with chloroform (200 mL eight times) and diethyl ether (200 mL eight times) successively. Aqueous, chloroform, and diethyl ether fractions were evaporated to dryness under vacuum. The purified fractions were subjected to TLC using two development systems S1 and S2, UV light at wavelength 366 nm. To define the best solvent system for separation of bergapten and methoxsalen, A. majus extracts were analyzed by TLC using development systems S1–S8. Retardation factor (Rf) of bergapten and methoxsalen was calculated in different development systems. PE extract 7.5 g of Ammi majus was dissolved in 10 mL of chloroform. Enough quantities were applied as bands on silica gel layer, SiO2, 60 F254 precoated layer thickness 2 mm, 20 cm × 20 cm plates, S1: benzene/ethyl acetate 90:10, v/v, UV light at wavelength 366 nm. The separated bands were scraped off and collected using a suitable spatula, and the compounds were extracted from SiO2 using several fractions of chloroform and EtOH, which were combined later and evaporated under vacuum. These bands were analyzed by TLC using S1 as the solvent system. The bands contained the desired materials were subjected to successive steps of preparative TLC using S1 as the solvent system until purification of bergapten and methoxsalen. All plants extracts were prepared and ran through C-18 column 5 μm (4.6 mm × 150 mm), isocratic 37% acetonitrile/water solvent, flow rate 1 mL/min, δmax for both coumarins standards was determined at δ218 nm for bergapten and δ249 nm for methoxsalen. The assay has been done in triplicate to ensure reproducibility. The lowest detection limit of the experiment was 0.004 mg/mL. Methoxsalen and bergapten with high purity were used as external standards to prepare the standard curves. Different combinations of acetonitrile and water were used separately to specify the best chromatographic mobile phase for the separation of the two structural isomers on the C-18 column using the reverse phase system. 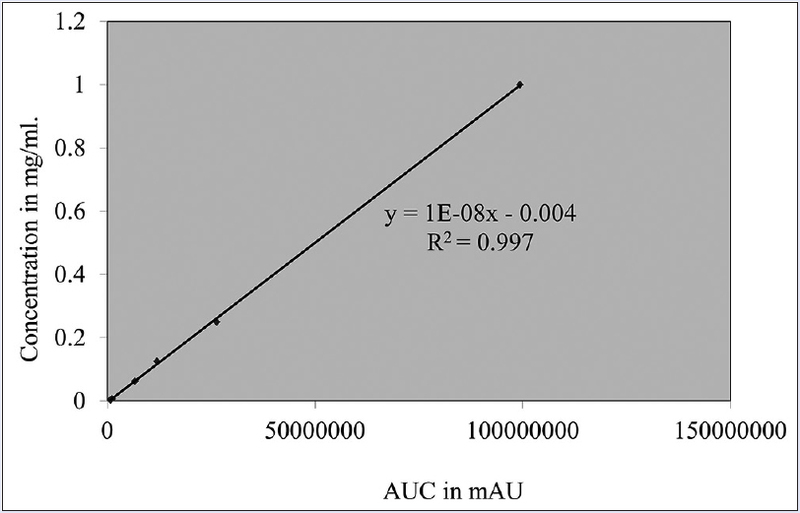 Serial dilutions of bergapten and methoxsalen (1, 0.25, 0.125, 0.0625, 0.008, and 0.004 mg/mL) were prepared in methanol and 20 μL injected into the HPLC system; then, area under the curve (AUC) plotted versus the standard concentrations to construct the calibration curves (n = 3). Y is the concentration in mg/mL, X is the AUC, 9E – 09 = 0.000000009, and 1E – 08 = 0.00000001. The plant extracts prepared in methanol at a concentration of 100 mg/mL and 20 μL were analyzed using the HPLC method mentioned above (n = 3). The availability of bergapten and methoxsalen in the plant extracts was confirmed by matching of retention time (Rt) in minutes with those of the pure compounds and by the addition of internal standard using the same conditions of HPLC mentioned above. 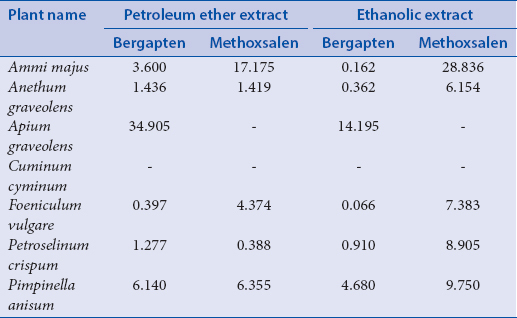 The abundance of bergapten and methoxsalen in the plant extract quantified utilizing equations (1) and (2), respectively. The antibacterial activities of bergapten, methoxsalen, PE, and EEs of all plants were determined by determination of minimal inhibitory concentration (MIC) against several clinical isolates provided by the Central Public Health Laboratory, Baghdad, using the microplate alamar blue assay.,, Plant extracts and pure compounds were used in concentrations from 2 μg/mL to 4096 μg/mL with DMSO final concentration of 3%. The bacterial density used finally was 5 × 105 CFU/mL. Ampicillin used as a control for the assay in concentrations ranged from 2 μg/mL to 256 μg/mL; solvent control, sterility control, and growth control were used in the study which was conducted utilizing 96-well plates, and all plates were incubated at 37°C for 24 h. 20 μL of alamar blue was added to each well in the plate which was incubated for further 4 h at 37°C. MICs were verified visually as the lowest concentration of extracts/pure compounds that prevented a blue-to-pink alamar blue color change, (n=3). Alamar blue and 96-well plates were supplied from Fisher Scientific, USA. The PE extract and EEs of all plants were examined first by TLC using S3 as a development system; the results revealed unclear separation and chromatogram indicating the presence of some unwanted materials which affected the separation patterns. The purified PE extract and its marc residue were tested on TLC plates using S1 and S3 as development systems aligned with the standards of bergapten and methoxsalen. Results revealed that the marc residues were deprived of these furanocoumarins; [Table 2] shows the weight of unpurified and purified PE extract. The purification of EE yielded chloroform, diethyl ether, and aqueous fractions; these fractions were checked by TLC aligned with bergapten and methoxsalen utilizing S1 and S2 as development systems. The results suggested that the chloroform and ethyl ether fractions were similar in composition; hence, they were combined and marked as the EE for future work. Aqueous fraction did not contain any of the furanocoumarins under the study; [Table 2] shows the weight of EEs. To define the best development system for separation of the two structural isomers (bergapten and methoxsalen) on a SiO2 thin layer, these compounds were analyzed individually and as a mixture on SiO2 TLC plate utilizing eight different development systems (S1–S8). [Table 3] shows the Rf of bergapten and methoxsalen in several development systems. The results showed that S1 was the best development system which we used in preparative TLC. The Rt of the two standards was 17.133 min for bergapten and 13.133 min for methoxsalen determined in HPLC system [Figure 2]. 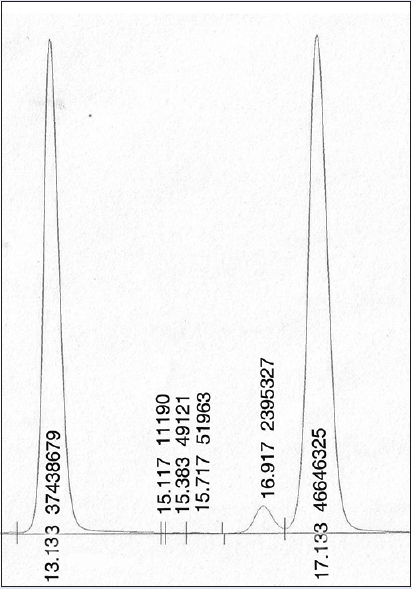 The quantities of bergapten and methoxsalen in the seeds of the plants under study were calculated utilizing calibration curves [Figure 3] and [Figure 4]. Results are shown in [Table 4], and their quantities in 50 g of seeds of each plant were calculated and are shown in [Table 5]. The separation of bergapten and methoxsalen from A. majus was accomplished using S1 as the development system and 2 mm SiO2 plates. 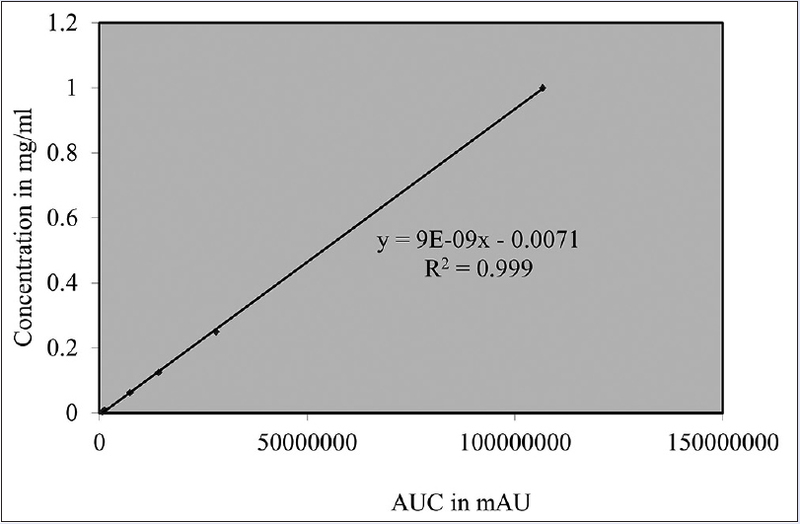 Three major bands were detected by UV-366 nm, and they coded as A, B, and C [Figure 5]. Metabolites were washed from SiO2 using chloroform and EtOH for several times. The contents of the bands were checked by TLC against the standards using two development systems (S1 and S2); the results revealed that bands A and B contain bergapten and methoxsalen. 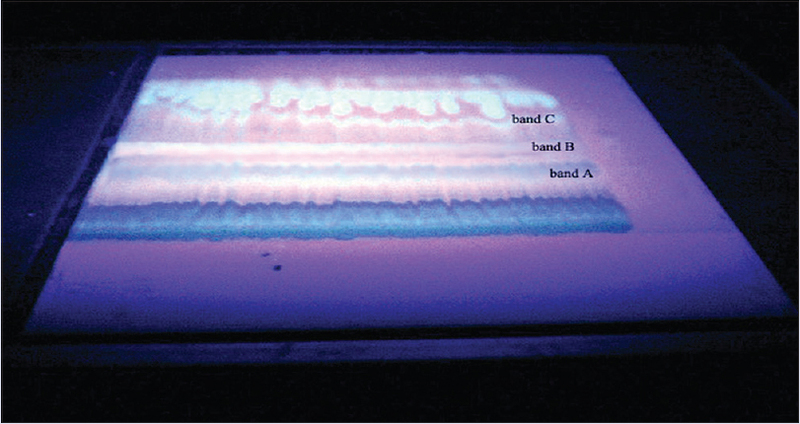 Bands A and B were mixed and evaporated to dryness yielding ≈ 42 mg crude mixture, and the band was coded as band AB. Band AB was subjected to preparative TLC using S1 as development system, yielding a characteristic band, coded as band bx, which contains bergapten and xanthotoxin [Figure 6]. Band bx was scraped off and extracted by chloroform and EtOH; as mentioned earlier, solvents evaporated to dryness to get ≈ 18.03 mg mixture of bergapten and methoxsalen, the mixture (band bx) was developed on SiO2 layer 0.75 mm in thickness, development system was S1, the mixture applied one time on each plate and the plate developed in the development system for three times to get better separation, two distinct bands were separated representing bergapten and xanthotoxin. Bergapten 2.8 mg was crystallized out of 95% EtOH as white needles and methoxsalen 14.07 mg as silky needles from hot water. The melting points of these two compounds were measured as 185°C–188°C for bergapten and 147°C–149°C for methoxsalen, which were in agreement with melting points of bergapten and methoxsalen standards. The isolated compounds were run on SiO2 TLC plates using different development systems and in HPLC system against standards to confirm identity. 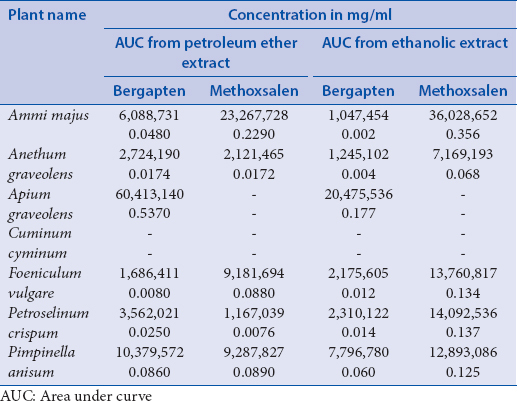 The antibacterial activities of all extracts and pure compounds were ranged from weak to intermediate against several Gram-positive and Gram-negative bacteria [Table 6] and [Table 7]. EtOH extracted more materials than PE; the analysis of bergapten and methoxsalen by eight solvent systems revealed that methoxsalen was polar as compared to bergapten which showed less polarity. Cuminum cyminum was deprived of bergapten and methoxsalen, and methoxsalen was not detected from Apium graveolens. Bergapten was abundant in PE more than in EtOH; on the other hand, EtOH was rich in methoxsalen, which is attributed to lower polarity of bergapten as compared to methoxsalen. Bergapten and methoxsalen were separated efficiently by preparative TLC in a recovery percentage of 81%. Xanthotoxin and isopimpinellin were isolated from the fruits of A. majus using column and partition chromatography. All plants showed weak to moderate antibacterial activities, C. cyminum was the least active extract compared to other plants, and all the extracts were more efficient against Gram-positive isolates than negative bacterial cells. In general, methoxsalen showed more potent antibacterial effects than bergapten against all bacterial isolates used in this study. Anethum graveolens ethanolic fraction affecting Helicobacter pylori one of stomach ulcer-causative agents, the essential oil of Shbint was active in vitro against several Candida with MIC of 0.3–0.6 μL/mL. The methanolic extract of the leaves showed weak to moderate antibacterial activities with MIC of 5000 μg/mL against Escherichia coli and 2500 μg/mL against Pseudomonas aeruginosa and Staphylococcus aureus, which come in accordance with our results on the other hand, the extraction of A. graveolens by MeOH leading to the production of moderate antibacterial fraction with MIC of 1250 μg/mL against E. coli and S. aureus and 5000 μg/mL against P. aeruginosa.A. graveolens oil showed some antibacterial activities against Alcaligenes faecalis MIC equal to 5 μL/mL. The leaves extract of A. graveolens acted against several Candida species with MIC ranged from 78 to 312 μg/mL. C. cyminum seeds oil fraction affecting Salmonella typhimurium and E. coli potently with MIC of 0.25 μL/mL and 0.5 μL/mL, respectively, and showed weak antibacterial activities against several S. aureus resistant strains. In another study, the antibacterial activities of the oil against S. aureus, Staphylococcus epidermidis, Bacillus cereus, and E. coli were reported to be 78 μg/mL. Furthermore, the oil showed some antifungal activities against Candida albicans and Candida dubliniensis with MIC of 280 μg/mL, the effect of methanolic extract of Kammun against E. coli, S. aureus, and P. aeruginosa was remarkably weak with MIC of 5000 μg/mL. Foeniculum vulgare var. dulce aerial parts contain bergaptol. In another study, several coumarins such as psoralen, bergapten, and imperatorin were separated from the stems of this plant and showed weak activities against E. coli; however, our results confirm that the seeds of F. vulgare contain methoxsalen in addition to bergapten. The oil of F. vulgare showed very high MIC of 10000 μg/mL against S. aureus and 250 μg/mL against E. coli, while in another study, the oil showed MIC of 62.5 μg/mL against E. coli. The seeds EE showed moderate antibacterial activities from 62.5–500 μg/mL against E. coli, Bacillus subtilis, and S. aureus.Mycobacterium tuberculosis growth was inhibited by the methanolic extract of F. vulgare stems at MIC of >200 μg/mL and at 200 μg/mL of its hexane extracts. Petroselinum crispum aerial parts essential oil showed good antibacterial activities with MIC of 11–44 μg/mL and minimum bactericidal concentration of 2810–11,250 μg/mL against different Vibrio strains. The levels of psoralen, methoxsalen, oxypeucedanin, and bergapten from the methanolic extract of P. crispum aerial parts were measured before and they were 1.77–46.04 mg/kg of plant weight.Pimpinella anisum oil was active against Gram-positive bacteria (B. cereus and S. aureus) with MIC of 62.5–125 μg/mL while its MIC against Gram-negative bacteria (E. coli, Klebsiella pneumoniae and P. aeruginosa) was >500 μg/mL and its methanolic extract showed MIC of 500 μg/mL against S. aureus. The methanolic extract had MIC of 5000 μg/mL against S. aureus, E. coli, and P. aeruginosa. Two structural isomers bergapten and xanthotoxin were purified efficiently in a high yield from A. majus, using preparative TLC and benzene/ethyl acetate 90:10, v/v as the development system. Our results showed that PE has higher extraction power of bergapten compared to EtOH and vice versa for xanthotoxin. Analysis of these isomers by HPLC revealed that the mobile phase formed of 37% of acetonitrile in water was efficient to separate these furanocoumarins by 4 min on a nonpolar column. The synthesis abilities of furanocoumarins in plants of the same family are different which can be attributed to the genetic variation or availability of the building blocks. The antibacterial activity of the plants discussed above from previous researches, showed partial agreement with our results and between each other, and this is probably attributed to the type of extract, part of the plant extracted and abundance of active constituents in that part, time of harvesting, type of method used for evaluation of the antibacterial activities, and virulence factors of the bacterial isolates. The plants extracts, bergapten and methoxsalen, showed weak to intermediate antibacterial activities against several bacterial isolates, prominently against Gram-positive bacteria. These findings support the medicinal use of seeds of seven plants from Apiaceae family and quantify the two pharmacologically important furanocoumarins (bergapten and methoxsalen). Cox PA. The ethnobotanical approach to drug discovery: Strengths and limitations. Ciba Found Symp 1994;185:25-36. Ojala T, Remes S, Haansuu P, Vuorela H, Hiltunen R, Haahtela K, et al. Antimicrobial activity of some coumarin containing herbal plants growing in Finland. J Ethnopharmacol 2000;73:299-305. Tietjen KG, Hunkler D, Matern U. Differential response of cultured parsley cells to elicitors from two non-pathogenic strains of fungi 1. Identification of induced products as coumarin derivatives. Eur J Biochem 1983;131:401-7. Soine TO. Naturally occurring coumarins and related physiological activities. J Pharm Sci 1964;53:231-64. Evans WC. Trease and Evans' Pharmacognosy. 14th ed. UK: WB Saunders Company Ltd.; 1999. Hehmann M, Lukacin R, Ekiert H, Matern U. Furanocoumarin biosynthesis in Ammi majus L. Cloning of bergaptol O-methyltransferase. Eur J Biochem 2004;271:932-40. Pathak MA, Parrish JA, Fitzpatrick TB. Psoralens in photochemotherapy of skin diseases. Farmaco Sci 1981;36:479-91. Hönigsmann H, Jaschke E, Gschnait F, Brenner W, Fritsch P, Wolff K. 5-Methoxypsoralen (Bergapten) in photochemotherapy of psoriasis. Br J Dermatol 1979;101:369-78. Hann SK, Cho MY, Im S, Park YK. Treatment of vitiligo with oral 5-methoxypsoralen. J Dermatol 1991;18:324-9. Chakravarty HL. Plant wealth of Iraq (A dictionary of economic plants). India: S. N. Guharay Sree Saraswaty Press Ltd.; 1976. Al-Rawi A, Chakravarty HL. 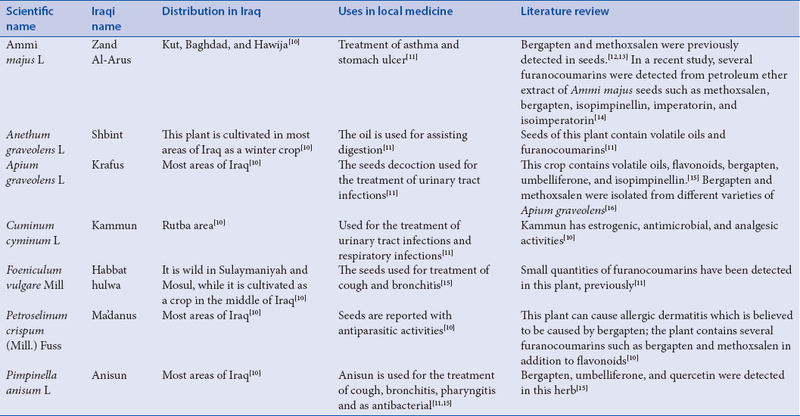 Medicinal plants of Iraq. Baghdad, Iraq: The Government Press; 1964. Chevallier A. Encyclopedia of Medicinal Plants. 1st ed. London, UK: Dorling Kindersley; 1996. Bown D. Encyclopedia of Herbs and Their Uses. London, UK: Dorling Kindersley; 1995. Bartnik M, Mazurek AK. Isolation of methoxyfuranocoumarins from Ammi majus by centrifugal partition chromatography. J Chromatogr Sci 2016;54:10-6. Anderson LA, Phillipson JD. Herbal Medicines: A Guide for Healthcare Professionals. London, UK: Pharmaceutical Press; 2002. Beier RC, Ivie GW, Oertli EH, Holt DL. HPLC analysis of linear furocoumarins (psoralens) in healthy celery (Apium graveolens ). Food Chem Toxicol 1983;21:163-5. Collins L, Franzblau SG. Microplate alamar blue assay versus BACTEC 460 system for high-throughput screening of compounds against Mycobacterium tuberculosis and Mycobacterium avium . Antimicrob Agents Chemother 1997;41:1004-9. Kumar M, Khan IA, Verma V, Qazi GN. Microplate nitrate reductase assay versus Alamar Blue assay for MIC determination of Mycobacterium tuberculosis . Int J Tuberc Lung Dis 2005;9:939-41. Leonard B, Coronel J, Siedner M, Grandjean L, Caviedes L, Navarro P, et al. Inter- and intra-assay reproducibility of microplate Alamar blue assay results for isoniazid, rifampicin, ethambutol, streptomycin, ciprofloxacin, and capreomycin drug susceptibility testing of Mycobacterium tuberculosis . J Clin Microbiol 2008;46:3526-9. Masadeh MM, Alkofahi AS, Alzoubi KH, Tumah HN, Bani-Hani K. Anti-Helicobactor pylori activity of some Jordanian medicinal plants. Pharm Biol 2014;52:566-9. Zeng H, Tian J, Zheng Y, Ban X, Zeng J, Mao Y, et al. In vitro and in vivo activities of essential oil from the seed of Anethum graveolens L. against Candida spp. Evid Based Complement Alternat Med 2011;2011:659704. Edziri H, Ammar S, Souad L, Mahjoub MA, Mastouri M, Aouni M, et al . In vitro evaluation of antimicrobial and antioxidant activities of some tunisian vegetables. S Afr J Bot 2012;78:252-6. Alves-Silva J, Dias DS, Pintado ME, Pérez-Álvarez JA, Fernández-López J, Viuda-Martos M. Chemical composition and in vitro antimicrobial, antifungal and antioxidant properties of essential oils obtained from some herbs widely used in Portugal. Food Control 2013;32:371-8. Bisht DS, Menon KR, Singhal MK. Comparative antimicrobial activity of essential oils of Cuminum cyminum L. and Foeniculum vulgare mill. seeds against Salmonella typhimurium and Escherichia coli . J Essent Oil Bearing Plants 2014;17:617-22. Raja SA, Ashraf M, Anjum AA, Javeed A, Ijaz T, Attiq A. Antibacterial activity of essential oils extracted from medicinal plants against multi-drug resistant Staphylococcus aureus . J Anim Plant Sci 2016;26:415-23. Hajlaoui H, Mighri H, Noumi E, Snoussi M, Trabelsi N, Ksouri R, et al. Chemical composition and biological activities of Tunisian Cuminum cyminum L. essential oil: A high effectiveness against Vibrio spp. strains. Food Chem Toxicol 2010;48:2186-92. Naeini A, Naderi NJ, Shokri H. Analysis and in vitro anti-Candida antifungal activity of Cuminum cyminum and Salvadora persica herbs extracts against pathogenic Candida strains. J Mycol Med 2014;24:13-8. Singh MK, Singh N. Comparison of antimicrobial activity of herbs & spices and their phytochemical determination. Int J Green Pharm 2011;5:229-35. Esquivel-Ferriño PC, Favela-Hernández JM, Garza-González E, Waksman N, Ríos MY, del Rayo Camacho-Corona M. Antimycobacterial activity of constituents from Foeniculum vulgare var. dulce grown in Mexico. Molecules 2012;17:8471-82. Kwon YS, Choi WG, Kim WJ, Kim WK, Kim MJ, Kang WH, et al. Antimicrobial constituents of Foeniculum vulgare . Arch Pharm Res 2002;25:154-7. Diao W, Hu Q, Zhang H, Xu J. Chemical composition, antibacterial activity and mechanism of action of essential oil from seeds of fennel (Foeniculum vulgare mill.). Food Control 2014;35:109-16. Mota AS, Martins MR, Arantes S, Lopes VR, Bettencourt E, Pombal S, et al. Antimicrobial activity and chemical composition of the essential oils of Portuguese Foeniculum vulgare fruits. Nat Prod Commun 2015;10:673-6. Salami M, Rahimmalek M, Ehtemam MH. Inhibitory effect of different fennel (Foeniculum vulgare ) samples and their phenolic compounds on formation of advanced glycation products and comparison of antimicrobial and antioxidant activities. Food Chem 2016;213:196-205. Camacho-Corona Mdel R, Ramírez-Cabrera MA, Santiago OG, Garza-González E, Palacios Ide P, Luna-Herrera J. Activity against drug resistant-tuberculosis strains of plants used in Mexican traditional medicine to treat tuberculosis and other respiratory diseases. Phytother Res 2008;22:82-5. Snoussi M, Dehmani A, Noumi E, Flamini G, Papetti A. Chemical composition and antibiofilm activity of Petroselinum crispum and Ocimum basilicum essential oils against Vibrio spp. strains. Microb Pathog 2016;90:13-21. Caboni P, Saba M, Oplos C, Aissani N, Maxia A, Menkissoglu-Spiroudi U, et al . Nematicidal activity of furanocoumarins from parsley against meloidogyne spp. Pest Manag Sci 2015;71:1099-105. Al-Bayati FA. Synergistic antibacterial activity between Thymus vulgaris and Pimpinella anisum essential oils and methanol extracts. J Ethnopharmacol 2008;116:403-6.